Union County, NJ – The Union County Board of Chosen Freeholders invites music fans of all ages to Rhythm and Blues by the Brook, a free outdoor music festival to be held at Cedar Brook Park in Plainfield, rain or shine, on Saturday, June 2 from 12:00 noon to 6:00 p.m. Headlining the event is the beloved funk, soul and R&B band Ohio Players, best known for their monster hits Fire, Love Rollercoaster and Funky Worm. “Cedar Brook Park is a jewel in the crown for Union County and the City of Plainfield. 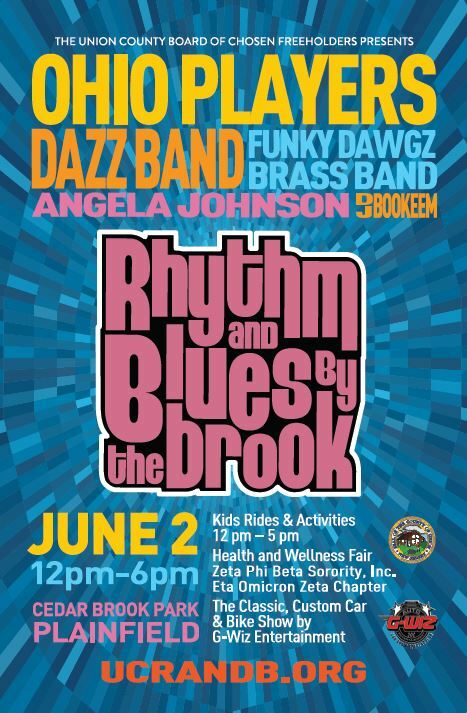 The Rhythm and Blues by the Brook festival is an opportunity for our residents to get together with friends and family for an afternoon of music, community and healthy outdoor fun,” said Freeholder Linda Carter, a lifelong resident of Plainfield. In their heyday the Ohio Players produced 17 Top 40 hits, with several platinum and gold selling albums, after which the “funkiest band on Earth” continued to influence some of the biggest names in music including Snoop Dogg, Dr. Dre, Ice Cube, Ice-T, Beastie Boys, Mary J Blige and many more. They were inducted into the first class of the Official R&B Music Hall of Fame in 2013, and last year they released their first new music in almost 30 years. This year’s Rhythm and Blues by the Brook will run from 12:00 p.m. to 6:00 p.m., with DJ Bookeem serving as the MC throughout the day. As always, Rhythm and Blues by the Brook will feature free children’s activities including inflatables, pony rides and a petting zoo. A special feature this year will be the American Legacy “Know Your History” mobile truck exhibit of African-American history and culture. Sponsored by the City of Plainfield, the mobile truck is an 18-wheeler transformed into a history museum focusing on the milestones and newsmakers of the 19th and 20th centuries, including artifacts, memorabilia, photographs and artworks. The first concert begins at 12:30 p.m. with Angela Johnson and continues with Funky Dawgz Brass Band at 1:45 p.m. The Funky Dawgz Brass Band is an eight-piece horn band that frequently tours the country with performers like We the Kings, Dispatch, The Soul Rebels, Snarky Puppy and more. At 3:15 the Dazz Band takes the stage. The Dazz Band is a Grammy Award-winning R&B funk band from Cleveland, Ohio most known for their hit song Let it Whip! The festivities continue as The Ohio Players take the stage at 4:45 p.m. The event also includes a marketplace featuring food vendors, a free car show presented by G-Wiz, and a health and wellness fair by Zeta Phi Beta Sorority. For more information about Rhythm and Blues by the Brook and Cedar Brook Park, please call the Union County Department of Parks and Recreation at 908-527-4900 or visit ucnj.org/parks.